What can you offer a seller to obtain a better price? How do you make them comfortable with you as a buyer? 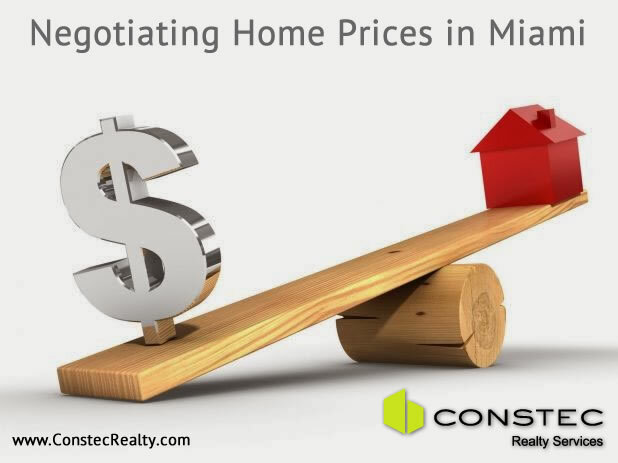 Let’s say you have found a house or condo in Miami that meets your needs and decide to negotiate the purchase with the hope of agreeing to the terms of contract and eventually closing. All other elements aside, the most relevant term parties’ bargain over is the purchase price. You can haggle over price and reach some satisfactory result but it is my experience that there are also other terms in a purchase that can help you as a buyer attain an even better price. This shows commitment. You are also removing remarketing risk from sellers. It also helps prioritize offers in the event of simultaneous offers being presented to sellers. Sellers are provided greater certainty and can more easily move on to their next property. Request the time that you need in order to become comfortable with the property. Assume that upon a professional inspection everything will be and look similar to what you have seen through your untrained visual inspection (assume there are no hidden damages). Also make sure that listing agent has told you and seller has disclosed through a written disclosure statement the condition of property prior to presenting an offer. A condominium in a newer building will require less time for you as a buyer to become comfortable than a historical waterfront villa with seawall. In the event you need more time you should be able to negotiate an extension to the due diligence period you originally requested. As long as you communicate openly with your counterparty they would understand you need further inspections to become comfortable with the home and eventually move to purchase. I just touched on this point but to expand let me just mention that many times sellers don’t know that the house has hidden damages. If you bring them along though the process they might be willing to offer a discount based on what was discovered. Lastly, you are attempting to get the best price for the home. Most likely your first offer will not be the offer the seller will accept; but offering substantially below market value will denote a lack of understanding of market conditions and hence your seriousness as a buyer, or worse yet, imply that you believe seller is in distress when the price does not reflect it. Uncertainty kills deals, while certainty provides the best path for all parties. Economic theory dictates that when facing uncertainty consumers will over estimate costs and underestimate benefits, which is a prescription for disaster in any transaction. The buyer controls the process and has many ways to get out with practically no negative consequences so it is always advisable to use it to your advantage and provide assurance to the seller of your commitment. Sellers will thank you with a better price!